The Route2Cloud predictive dialer automatically dials multiple contacts instantaneously from a pre-configured, pre-assigned list of leads. It can screen for busy signals, voicemail, no-answers and disconnected numbers in record time, and can drastically reduce abandonment rates. Administrators can use our robust set of scripting and dispositioning tools to configure the agent UI to their exact specifications, and agents can handle calls quickly and effortlessly via our 100% browser-based unified agent desktop. Watch call volumes increase in your contact center up to 4x while costs drop due to increased agent productivity. Learn What Route2Cloud’s predictive dialer can do for your outbound call center today. Smart Dialing for Effortless Automation. Our predictive dialer handles not only the initial dialing and call screening to ensure more live conversations, it also instantly and intelligently predicts which outbound agent will be ready to answer the live call the soonest. 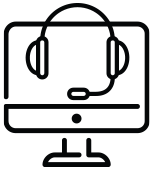 Our predictive algorithm was designed for speed and accuracy, and Route2Cloud’s cloud call center software’s reliable architecture and unmatched uptime ensure your customers will always reach a friendly live voice once the predictive element routes the call. Meet and Exceed Call Quotas With Fewer Agents and Less Effort. Reach more of your customers faster with a dialing solution that takes the tedious, repetitive work away from agents and dramatically increases their productivity and efficiency by weeding out unproductive calls. Our predictive dialing solution is essential for high-volume call centers and large-scale outbound telemarketing companies. Small businesses can greatly benefit from predictive dialers as well, keeping your costs low and your output high with less agents than you’d need to hire for manual dialing. Route2Cloud’s call center software is built for extreme flexibility. Every business has unique needs, and our goal is to provide you with features and controls that give you exactly the results you need. With our highly configurable predictive dialer, you can adjust our algorithm yourself to suit your contact center’s dialing needs. You can decide how many simultaneous leads our system will dial per agent at any given time. Take control of your call center’s output with our robust granular feature sets and advanced capabilities. Reach everyone on your list with a dialer that increases your call volume while eliminating human error and reducing agent idle time by up to 28%. The Route2Cloud predictive dialer can reach contacts much faster than a human being, and it can dial multiple numbers simultaneously — all within a fraction of the time it would take one agent to finish punching in one phone number. And our predictive dialers aren’t prone to human error. They don’t accidentally dial wrong numbers and they don’t transfer contacts to the wrong agent — or hang up on them by mistake. You already know the Route2Cloud predictive dialer’s algorithm is smart enough to screen calls faster and more accurately than your agents ever could. But did you know that it uses machine learning to continuously improve accuracy and speed up your calling patterns, every day? Our smart dialer gathers useful insights from customer information and statistics it collects throughout its regular processes. It then intelligently adjusts its own calling patterns and behaviors based on the lessons it learns. The Route2Cloud Predictive Dialer. Built Smarter. Route2Cloud’s cloud contact center solutions are widely considered the best call center software around. Not only do we offer advanced scalability, reliability, and flexibility, but our award-winning customer care is available to you every step of the way. Our above-and-beyond customer satisfaction ethos extends to our predictive dialer, which was built intentionally with your needs in mind: speed, accuracy and reliability. The result? A lightning-fast, intelligent dialer that eliminates the need for additional agents, saving you time and money by cutting out costly hiring, onboarding, and training expenses. Effortless customers experiences become standard, and call quality increases even as your contact center reaches up to quadrupled call volume.